In The Pursuit of Pretty Shoes: Medieval Torture Treatments?--Surely Not! Buy your stamps here . . .
Having been diagnosed with Charcot Marie Tooth Syndrome, I have recently embarked on a journey of eye-opening and life changing discovery that includes painful surgeries, costly medical bills, and fistfuls of vitamins and supplements. . . all in the pursuit of health, longevity, and of course pretty shoes! So, yesterday we removed the stitches and set the cast. I truly had mixed feelings anticipating this day. . . Last year, between tweezing 50+ stitches over 45 minutes and then attempting to push a swollen, broken foot upward into a 90 degree angle, I shed quite a few crocodile tears. I knew the day would not be complete without a lot of pain, but I also knew that getting a cast also meant ditching that bulky, heavy splint and the prospect of more mobility (and showering, who wouldn't endure a few moments of discomfort for a long, hot shower, right?) But, surprisingly today was easy-peasy! The only torture I experienced were a slew of zingers Dr. W kept slinging my way . . . In what seemed a matter of seconds, Dr. W's new surgical resident had removed all the stitches and was asking me what color cast I wanted?! I opted for boring black. (After all, I have to return to a place of business in a few weeks; I have to appear somewhat professional and the scooter and backpack don't help the cause any, believe me. . . I mean, I look more like a 3rd grader than a Marketing Director!) 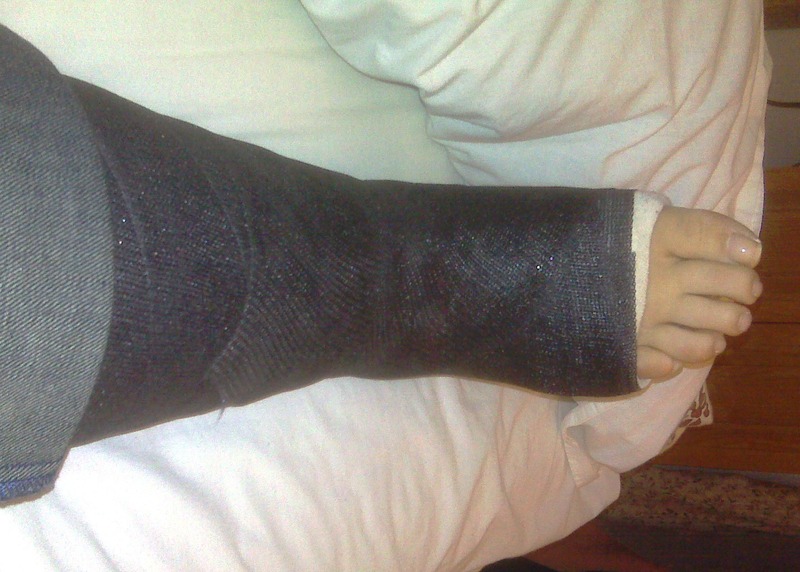 A few minutes later and with dry eyes, I sat up, viewed my new cast and wiggled my toes. And, the good news I told Dr. W is that I am already feeling better than I did at the same stage last year! After getting myself up and wheeling myself out of the exam room, I asked him if I could go bother his assistant Karen (my other BFF, by the way . . .). He bid me adieu by saying, "Yeah, just stop bothering me! Will you just leave already?" Did I mention that my appointment was nothing but an onlsaught of zingers? But, even funnier than he was his entire staff today. From the x-ray tech to the nurses, every person I encountered kept asking me, "Is this another surgery?" Yes, indeed; it seems I have not had enough of his torture--either physical or emotional--yet! Need A Shoulder To Lean On? Surgically Speaking . . .